I have recently been updating all of the databases I keep as we get started on another NFL season, and something I have kept for a while is a sheet on how teams go about their business in building a roster. There is no tried and true way to have automatic success in the NFL. Too many things can go wrong even if you follow the recipe of teams that came before you. You can do everything perfect, but then an untimely injury, the simple bounce of fumble, or the trajectory of a key field goal can make a dream season dissolve into a decent one in the blink of an eye. But, if you follow football closely in this modern era of a tight salary cap, short rookie contracts, and of course, free agency, you can see that now - more than ever - the teams that build through a majority of college entry players (both drafted players and undrafted free agents) are generally the same ones who enjoy sustained success. Those who exhibit impatience and believe in the "quick fix" of free agency - which often means paying premium dollars for players who other teams allowed to leave and often are in their late 20's - generally do not enjoy sustained success. Again, it is not simply a math equation. You can still draft poor players and lose. You can also utilize free agency effectively and win. But, when we speak in large generalizations, each year we do believe that franchises that grow their own talent from the age of 22 seem to often have a franchise that can sit in the playoff mix for several years more than the competition. Now, up top you can see the Super Bowl winners of the 2010, 2012, and 2014 Super Bowls, the losers of the 2011, 2012 Super Bowls, and 4 teams that have been in the playoffs pretty much every year of late - Green Bay, New England, Baltimore, and San Francisco (missed last year). You also see the Bengals who have been going to the playoffs frequently, the Rams and Vikings, who are believed to be on their way this year by many, and the Cowboys. Impressive group. Those in the "bottom 5" are several teams that are considered "a mess" and have pretty much rebooted their entire franchise (fired coach, fired GM, or both) recently. They are starting over and have to figure out how to do it better this time. Andrew Luck covers issues with the Colts, but otherwise, these squads as a group are a step down. You can find exceptions in each group. That isn't the point of this. But, the Cowboys on the top list means they are drafting better than they have been, and that means they don't have to constantly dig through the dumpsters of the league looking for starters. They are growing their own. The color changes represent the head coach tenures. Garrett in silver, Wade in Blue, Parcells in silver again. 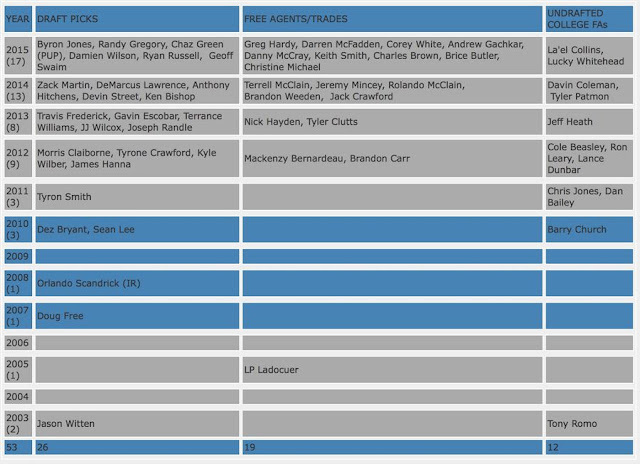 It may be somewhat difficult to read, but it shows the 57 players - the active roster plus the 2 suspended players (Hardy and McClain) and the 2 injured players (Green and Scandrick). It shows what I refer to as the "4-year conveyor belt" of contracts in the league. Draft a player and then 4 years later you either extend him with a contract or replace him with a younger draftee. It is what good teams do. 26 draftees and 12 undrafted draftees means 38 of the 53 players are homegrown (71.7%). That is the 6th highest total in all of football. It might not mean they are winning a Super Bowl, but it does mean that they are replacing losses with many of their own and are only using free agency for a spot purchase rather than an entire truckload of veteran talent to plug a dozen holes. Above it is Andy Reid's guys in white, Kelly's haul in Green. You can see how they are going for the quick fix and pretty much replacing Andy Reid's holdovers with other veterans from elsewhere (including Dallas). 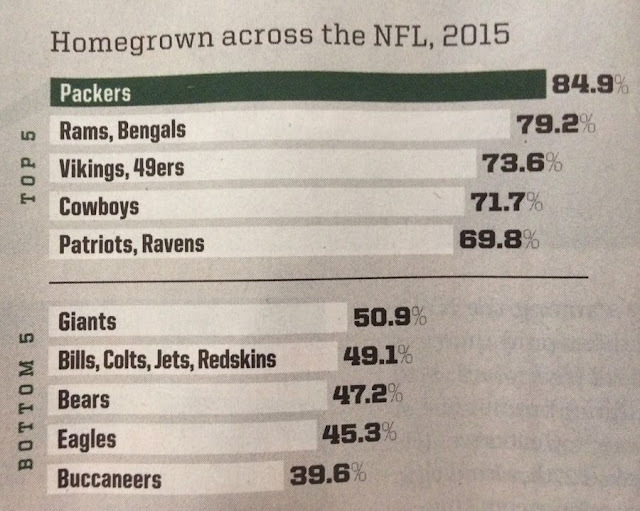 They have 20 draftees (11 from Kelly, 9 still from Reid) and 5 undrafted free agents to constitute just 25 of their 53 men (47.1%) which means my list and Sports Illustrated's list must have a transaction difference as the graphic they use claims just 24 homegrowns. What do these lists mean? Well, it shows long snappers can keep their job longer than pretty much anyone as both teams LS has been there since 2005 and 2006, respectively. But, it also shows that the Cowboys have a system in place, while the Eagles are still trying to figure out how this is all going to work. You could argue that they feel they are in Year 1 as Kelly has been buying his own groceries for less than a year. Does homegrown mean success? No, but it seems to be something "good teams do" and that means paying guys who you have lived with for 4 seasons (your own draftees) rather than paying a guy someone else got tired of. If nothing else, I think it demonstrates that the Cowboys, over the course of the last few years, have amazingly become one of those teams that other teams try to emulate. It has been a while since that has been the case around here, but full credit to the Cowboys for having a clear and defined philosophy for roster building. The league is noticing.